PRICE: $18.50 which includes US shipping. 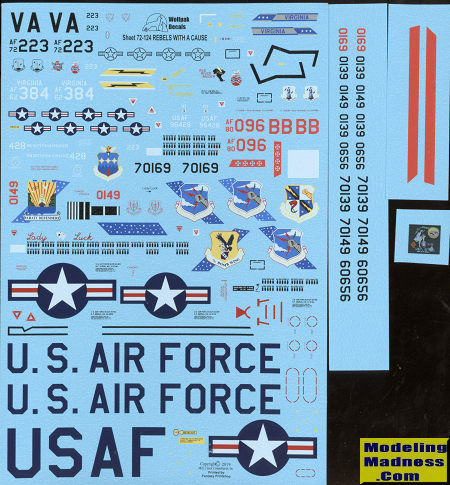 This sheet from Wolfpak decals has another nice mixture of subjects in it. Among the eight options, it starts out with a pair from the Virginia ANG, which is the reason for the title of this sheet. The initial offering is an A-7D from the 1987 time period in the green/grey wraparound scheme of FS 34079 and 36081, which is actually quite a bit darker than the profile shows. Next up is one of the 149 TFS' F-105Ds from the early 1970s. This one is named Red River Ranger. 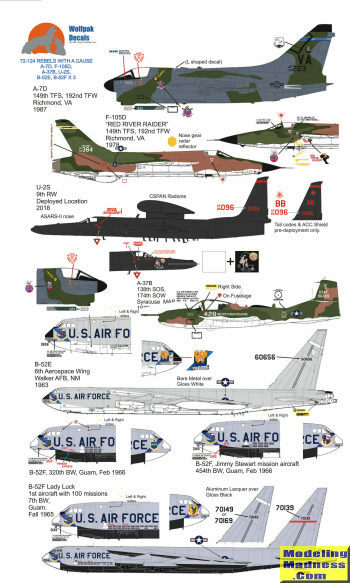 The U-2S of the 9 RW is the modern option for this sheet. It is from 2018 and carries nose art on the left side. The A-37B is one that was flown by the 138 TASS, New York ANG in 1978. It is in the standard SEA camouflage scheme. The sheet ends with four B-52s from the 1963-66 time frame. Those from 1966 are B-52F aircraft from the 7th and 320 BW, at the time based on Guam. The very bottom plane on the instructions is Lady Luck which flew 100 combat missions. Another is one flown by the 454th BW and piloted by Jimmy Stewart. The first Stratofortress is a B-52E with the 6th Aerospace Wing at Walker AFB in 1963. Unlike the F models with their black undersides, this one has gloss white. I know I've said this before, but it is true. The instructions are the best in the business and you are provided with a list of kits and upgrade bits required. The decals are superbly printed by Fantasy Printshop.